It’s true. I cheated on Google AdWords so that I could measure A/B Google tests in my Google Analytics. First, the background. Lots of small websites and advertisers aren’t ready to take the multivariate testing plunge, so start by using Google AdWords to A/B test. This is pretty tried and true: You create two ads for the same AdGroup which are absolutely identical, down to the URL that shows on the Google page (SERP). However, when the customer clicks, each ad has a different landing page. Then the advertiser compares conversion rate (or revenue, or average order size) for all the customers who start with Ad1 vs Ad2. Google has recently made measuring different ad versions easier in the AdWords interface, but with Google Analytics, you still have to know how pull down the right menus and segment to see what you need. And even then, if the ads have the same name, you can’t tell them apart. Choose Marketing Optimization > Marketing Campaign Results > Campaign Conversion. 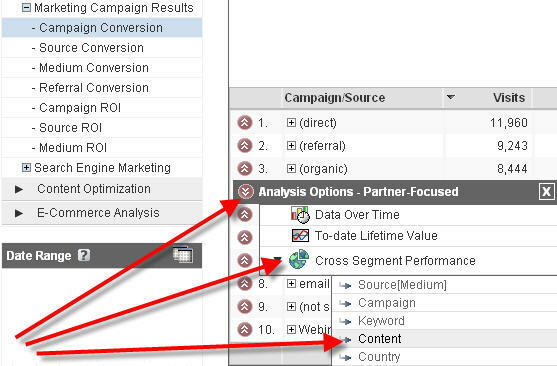 Left click on the Analysis Options next to one of your Google AdWord campaigns (which you get with the little red circle to the left of the campaigns – follow the top red arrow in my picture); choose Cross Segment performance (that’s the middle red arrow I’ve drawn); finally, choose Content. When you choose Content, you’ll get a list of the different ads that are running for that campaign, by goal. Step 2: This is where you cheat: Retitle your ads, ever so slightly. When you are using your Google AdWords to do A/B testing, as described above, the ads are identically worded. Google Analytics lists them out by title, which means, it can’t tell you that Ad1, titled, “Increase your Conversion Rate,” and which lands on www.lunametrics.com , is doing terribly, and that Ad2, titled, “Increase your Conversion Rate,” which lands on www.lunamerics.com/conversionrate, is doing great. It only sees one ad, called “Increase your Conversion Rate.” You can cheat on Google AdWords by changing the titles very very slightly. In this case, I would change one of the ads to have a capital Y in Your, so that it reads, “Increase Your Conversion Rate.” The difference is slight enough that it shouldn’t matter, and will enable you to read the results in GA.